The title of the book, an allusion to the time-traveling rules constructed in Star Trek, immediately lets the reader know that this is a time travel book, and that something will be changed during the course of the plot of the story. The reader is immediately taken back to the ancient world, as seen through the eyes of an unnamed time traveler who has come back to the time of Philip II of Macedon's time to observe the course of history. He, the time traveler, chooses to observe a Dionysian Mystery as it was being celebrated. During the course of the mystery, the time travelers saves a young man named Kleitos from being killed by the celebrants of the Mystery. Fleeing the scene, the time traveler then gets caught up in the ordeals surrounding the throne of Macedonia; in order to try and fit in to the correct time period, the time traveler adopts the name "Ptolemaios" and then ingratiates himself with Philip II as the Macedonian king prepares for to first subjugate the Greek city states and then take on the mighty Persian Empire.The most impressive part of this book is the research that has gone into the time period and the events that first shaped Alexander the Great as he rose to power as well as the circumstances surrounding Philip laying the groundwork for the Macedonian state to being the preeminent superpower in the region. The political intrigue surrounding the court of Philip was captured quite well and it was interesting to watch the events play out that led to Alexander ascending the throne as well as beginning the invasion of Persia.The strength of the story rests on the author's familiarity with the subject material and the characters involved in the book. This book is clearly well-researched, and the author does not feel the need to show his knowledge. The events surrounding the action of the book as well as those that shape the development of the characters come naturally, without While the amount of research that went into the historical time period as well as the characters is impressive, the language that evolves through the course of the story fails to live up to the research done. To his credit, the author tries to create a familiar, vulgar form of the language that the characters use with one another to show friendliness and trust between one another. This is a nice way to show the interaction among the characters, but it gets clunky and breaks the flow of the story. Instead of wondering what Ptolemaios was implying, the reader is left wondering whether Willis has shown up in the story when Philip II asks (paraphrasing) "Whatchoo talkin' bout?" or whether we've fallen into a Jeff Foxworthy routine, "Wanna get some lunch?" Though the language does not necessarily need to be in stiffly formal, archaic Ancient Greek, reading phrases involving American pidgin English is distracting.Overall, however, this is a well-researched book with a predictable ending (the story is 2300 years in the making), but an entertaining read at the very least. For any fan of Western Civilization as well as the legend of Alexander the Great, this makes a very nice addition to the historical fiction surrounding the greatest leader in Macedonian history. As a first novel, this is a solid introduction to the Alexander mythos, and the subsequent novels should help to solidly round out the legend as well as cap the Ptolemaian adventure. Alexander Geiger - Alexander Geiger is an accomplished writer, raconteur, lawyer, and amateur historian. 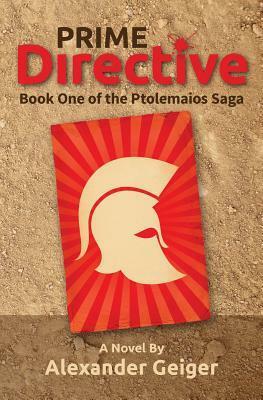 Prime Directive is his first venture into historical fiction. He’s a graduate of Princeton University and Cornell Law School.